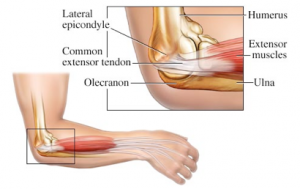 Tennis elbow is an extremely common tendonitis that is called lateral epicondylitis. Following are 5 things that you have to remember when it comes to tennis elbow injury. Tennis elbow is basically, an injury caused by overuse, which in turn is caused by degeneration of the tendon fibers that are attached to the bone of the elbow. The pain from such an injury can extend from the elbow and into the wrist and forearm because the tendons are extended and attached to the muscles of the wrist and hand. It’s understandable that repetitive and vigorous usage of the forearm muscles can cause your arm’s tendons to tear, therefore, those who are very active and take part in tennis and other such sports are at a higher risk of getting tennis elbow injury. There are other activities as well, that can cause tennis elbow injuries that are both recreational; such as squash, racquetball, fencing and occupational; such as hammering, meat cutting, raking, painting, and even weaving etc. In most patients however, the cause of tennis elbow injury is an unknown development, but physicians say old age or a lack of good blood flow are responsible for the muscle degeneration. Research about tennis elbow injury shows that, patients between 30 and 60 (both genders) years of age are more susceptible to the injury. There is a higher chance of the patients getting injured in their dominant arm as well, almost 60 to 75 percent! When it comes to experiencing pain related to the injury, patients suffering from it, often complain of a sharp pain over the lateral portion of the body part. This pain is heightened even more when the outside of the elbow is pressed, the wrist is extended, or by lifting or gripping objects, etc. It’s a very good idea to visit an orthopedic surgeon for correct diagnosis, to find out what is exactly causing the pain. For the diagnosis of a tennis elbow injury, the surgeon will perform a physical examination of your elbow and take into account your complete medical history. Unless there’s another cause of the elbow pain; such as arthritis or fracture; the surgeon won’t perform an X-ray scan. When it comes to treatment options and prevention, sufferers and patients are advised to stop all activities that might worsen the symptoms, to apply ice on the affected area, take rest and pain relievers. 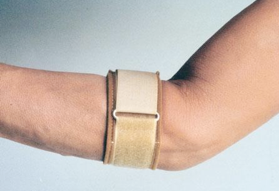 You may also need physical therapy sessions, and bracing can be helpful. An injection of steroid or possibly PRP therapy may help patients achieve relief and avoid surgery. If despite the prevention methods adopted, the pain still doesn’t go away or become worse, surgery intervention is necessary. Surgery for repairing tennis elbow injury is used in 10 percent cases and is often the only way to repair the diseased tendon tissue. Dr. Adam Farber is the Board Certified, Fellowship Trained orthopedic doctor at Phoenix Shoulder and Knee. He offers expert elbow treatments for tennis elbow. This usually includes nonoperative methods, but he also offers minimally invasive arthroscopic elbow surgery when indicated. Most insurance is accepted at the practice, call (480) 219-3342 today!